Seeing the arrays of megaliths (literally, “big rocks”) in and around the town of Carnac was the highlight of our tour of Brittany in northwestern France. The first ancient megaliths we'd seen were a couple of Spanish dolmens in varying states of collapse. 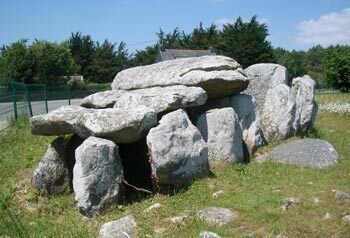 Dolmens, which we also saw in Carnac (“car-nack”), are ancient burial chambers (often communal) built with enormous rock slabs stood on end which were then capped by equally large, horizontally placed, rock slabs. The dolmens were then mounded with dry stone work or covered by an earthen mound that by now has usually eroded away. But what we hadn’t seen before were the alignments or seeming battalions of marching upright stones as were erected in Brittany. At the north end of Carnac there were about 3,000 of these ancient standing stones aligned in rows which originally extended for about 2½ miles without interruption. The widely spaced rows were 10-13 stones deep. They usually were graded in size, so that at one end of the array the stones were about 3’ high and at the opposite end they were about 10’ high. The stone arrangements are presumed to have had a spiritual significance or have been used in ancestor worship as their placement wasn’t precise enough to serve complex astronomical functions. One segment of the broken Locmariaquer menhir. We came across dozens of small menhirs around Carnac, but it was near the town of Locmariaquer (“lowk-maria-cur”) that we saw the broken remains of the oldest and largest menhir in Europe. This 280 ton chunk of granite stood 68’ high when it was erected about 4500 bce and was intentionally toppled a few hundred years later. It now lies in 4 monstrous, broken pieces. 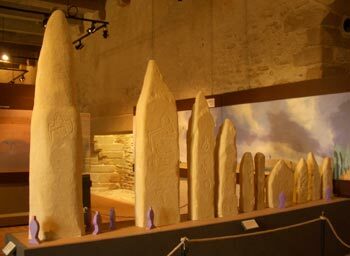 Scale model of Locmariaquer menhirs with purple people. 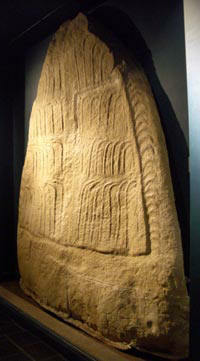 This huge, broken menhir was originally the tallest of 19 menhirs in a straight row at Locmariaquer. Though this largest menhir is still on site in strewn pieces, the second largest was recycled as capstones for 3 different dolmens. Two of the dolmens which were capped with the menhir pieces were found at Locmariaquer, with the third only recently being discovered at Gavrinis. We almost missed the Gavrinis (“gav ree nee”) tumulus (mound) and inner dolmen as the barriers to visiting it seemed too high. Bill was able to decipher enough of the in-French-only brochure to determine that seeing the off shore site depended on the height of the sea and required reservations. Those conditions plus the other exceptions and variations in the schedule made it look like a poor choice on which to gamble our time in an isolated area. But as luck would have it, the site’s office happened to be in the same little port that we pulled into for our lunch stop one day. I ducked into their office before the lunchtime closure and the English-speaking staff person quickly shrank the obstacles to seeing the site. Apparently the water level was in the acceptable range for visiting the island and we could call to reserve one of the available time slots for the boat if we decided to return in a few days. We were “camping” at Carnac about 20 miles away and our reading that night convinced us that we shouldn’t miss Gavrinis. It is a typical example of Neolithic stone architecture as it is a standing stone dolmen covered with a huge pile of loose rocks which in turn were covered by dirt. The result is an enormous mound easily seen as you approach its island base by boat. But aside from being an intact tumulus, the 3,000 bce Gavrinis structure is special for 2 other reasons. One reason is that its main chamber capstone was the middle piece of one of the broken menhirs a few miles away at Locmariaquer, which speaks to the resolve with which these Neolithic people transported their monumental rocks. Gavrinis is also special for the extensive decoration on the 2 dozen vertical interior stone slabs. It wasn't until1983 that archeologists determined that the capstone of the dolmen chamber at Gavrinis was 1of 3 pieces of a broken menhir at Locmariaquer. They assume it was transported across the bay by boat. The link between the Gavrinis piece and the Locmariaquer pieces had been easy to miss as at Gavrinis the decorated side of the menhir was the upside of the capstone, so it had been covered by loose stones and dirt. The decorated side of the other 2 dolmens capstones were face-down and so were visible from inside the chamber and their history as recycled menhir pieces had been more obvious. 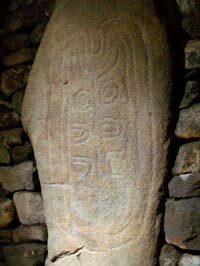 It was piecing together the 6’ to 9’ long engravings of 2 bulls and 3 other objects covering just over a third of the original menhir that allowed the relationship between the 3 capstones finally to be understood. The Locmariaquer menhir is one of a number that have been recycled and even the headstone in the main dolmen at Locmariaquer is thought to be the top of yet another menhir. It looks like most of the menhirs had a relatively short lifespan as a monumental stones. Like the menhirs, dolmens also were not static, as some were modified and used for additional burials over a period of as much as 3,000 years, but they continued to function as burial chambers the entire time. Of course, no photos were allowed inside the Gavrinis dolmen so we can’t show you the noteworthy decorated stones, but we do have a photo from a less elaborate dolmen interior not far away at Pierres Plates. The Gavrinis standing stones were roughly the size of a sheet of plywood (4’x8’) with the first foot or 2 underground and the stones varied in thickness from about 1’ to 3’. The coarse sandstone surfaces of each slab were deeply and decoratively carved by pounding with a quartz tool. The carvings elude interpretation as there are only about a half dozen patterns or shapes that are repeated over and over. The carvings looked like a person with an artistic eye had been creating interesting, superficial patterns in loose sand by running moderately spaced fingertips of one hand through it. Concentric circles, semicircles, and oblongs were the most frequently repeated patterns with a scattering of parallel wedge shapes that are presumed to represent the highly-prized polished stone axes of the time. Tumulus much later topped with St Michel church. It was the huge granite chunks weighing tons that were cut and arranged as standing stones that really caught our eye, but the tumuli in Carnac are also a testament to the motivation of these Neolithic people in Brittany. The largest tumulus we saw was so large that it was unremarkable—it just looked like a hill—a hill others later topped with a church. But this hill that measures 410’x200’x40’ was entirely a human construction over just one dolmen the size of a small room. It was a burial chamber for a single person assumed to be of great importance as there were mouth-watering finds of gleaming polished stone axes and jewelry inside. The discovery of this tumulus from about 4,000 bce plus the extensive standing stone alignments in the area makes the historians assume that this fishing and farming community was a focal point of power in the region. 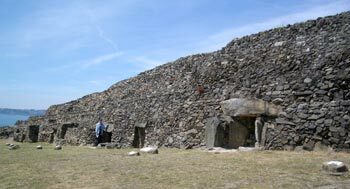 More than a week later we visited the Barnenez tumulus with its 11 dolmen chambers and passageways on the northern coast of Brittany. It was originally at least 200’ long and its burial chambers were actively used over centuries. 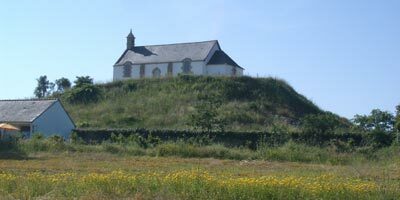 Unlike the St Michel tumulus in Carnac, the one at Barnenez currently had no dirt obscuring the extensive loose stone work. Sadly, part of it was destroyed in the 1950' when the local inhabitants began aggressively using the tumulus for a quarry of pre-cut stone. Loose stonework covering 11 Barnenez dolmens. The stunning decorated caves in France and northern Spain from 13,000-34,000 years ago are early and dramatic examples of the new abilities available to our species with our evolutionarily advanced frontal lobes. But it is these 4,000-7,000 year old megalithic structures in Brittany that highlight one of the opportunities that came with humans giving up the nomadic life and settling down: the capacity to undertake huge building projects. The ability to chisel out a 68’ long granite slab weighing 280 tons using nothing more than deer antlers and flint hammers, haul it 10-15 miles and then stand it on end takes a lot of organization and human power. Not until people settled down and congregated in larger cooperative groups could such enormous projects be undertaken, and the standing stones in Brittany are some of the very earliest examples of such endeavors. We suspect that both the cave art and the megaliths coincided with times of food surpluses. My mental image of our predecessors is of people spending every moment of their time in search of or in producing food. The prevalence of hunger in the world today and the notable famines of the recent past have only served to validate that erroneous belief. But we are slowly learning that there were eras of food plenty in the prehistoric and ancient worlds and we are guessing that they were a prerequisite to these astounding accomplishments that go well beyond the most basic needs of food, shelter and safety. All of the prehistoric cave art and figurines that we saw in southern France were produced during what early archeologist’s called the “Reindeer Age” (40,000-10,000 before present) because reindeer were so plentiful and easy to hunt. Some studies show that at times these people walked away and left meat behind as they had killed more than they could eat. There was even a substantial human population increase in the cold snap at the end of the Reindeer Age because of the abundance. We have also read that there were population increases that coincided with the transition to the Neolithic era (shortly after the end of the Reindeer Age)—increases that were largely due to the greater food availability that came from the switch to farming and animal husbandry from hunting and gathering. The Neolithic way of life arrived in Brittany about 6,000 bce—roughly 1,000 years before the first megaliths in the area—and we wonder if such food surpluses occurred at the time of the megaliths. But even if there weren’t huge food surpluses, they must have had some time on their hands to devote so much energy to non-essential activities like hauling enormous rocks around. Stonehenge in England and the pyramids of Egypt were the only megalithic structures I knew of before this traveling season. But both of those well known phenomena were started long after the Brittany megaliths. The first construction period at Stonehenge was about 3,100 bce, with its more sophisticated astronomical functions being incorporated about 1,500 bce. The early stones of Stonehenge were cut with deer antler picks like those in Brittany, with the large stones from 2,000 bce weighing about 50 tons (much less than the biggest stones in Carnac). In contrast, the first Egyptian pyramids weren’t begun until around 2,500 bce but their builders literally had an edge: metal tools. The use of bronze began earlier in Egypt than in much of Western Europe and the Egyptians cut and hauled the heaviest stones of all the megalithic builders, with the largest weighing 1,100 tons. The largest megaliths of Brittany were constructed about 5,000 bce, well before Stonehenge and the pyramids were on the drawing board. These first Breton (of Brittany) megaliths were cut and erected about 3,000 years before metal was known in the region, and probably about 2,300 years before the wheel was put in use in Sumer in the Near East. Early megalithic structures of a similar age to the ones we have seen in Brittany are scattered along the Atlantic coast from Ireland to Spain and also along the Mediterranean coast. The megaliths became the source for many legends as people struggled to understand how they occurred. Both the Romans and later the Christians put them to their own uses with Christian crosses still atop some menhirs. A number of Christian councils over the ages deemed the standing stones as evil and had some destroyed, as did some 19th century French road inspectors. It’s amazing any survived these hazards and the temptations to use them as convenient rock quarries. Over and over again our travels have reminded us of the compelling need humans have to make sense of that which we don't understand. It's a powerful and often very potent urge and capacity, but the resulting explanations sure can look strange in hindsight. Our little book on standing stones told of some of the myths. Giants and fairies were popular explanations for the builders of megaliths and some stones later became the focal point of fertility rituals. The stories became more elaborate over time, with explanations as to how the stones at Carnac went down to the water to drink on Christmas night and that other stones occasionally took ritual swims or twirls. And elsewhere I remember learning that as little as a few hundred years ago that many thought prehistoric stone axes found in fields were remnants of thunderbolts that were tossed out of the heavens. 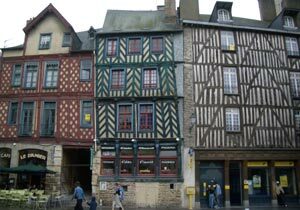 The Neolithic megaliths were what prompted us to visit Brittany, but the relatively more modern half timbered houses from 15th and 16th centuries added to the region’s charm. The surviving narrow cobbled streets with the slightly listing old homes and buildings certainly felt like a step back in time. And we had the impression that the people here really enjoy this bit of heritage and that’s its not just become a tourist feature. 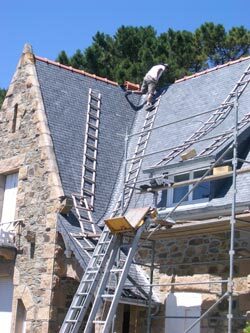 I envy the lovely slate roofs in many areas of Europe, but we sure didn't envy the guy in this photo who was finishing the installation of a new slate roof. In was in Brittany that we finally we felt like proper European travelers--at least for a few days. 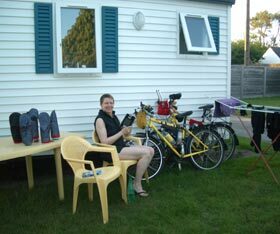 While in Carnac we rented a mobile home-styled ‘cabin’ permanently parked at a campground and we at last had a set of plastic chairs and a table. When we have camped in Europe we always felt like such peasants while we sat on the ground to take our meals and everyone else sat regally with their nifty folding tables and chairs. 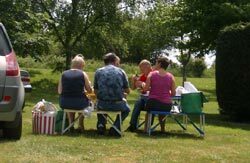 European campgrounds (and most of the few roadside rest areas) never provide picnic tables which are standard issue in the US, so all the campers carry their own, whether sleeping in a tent or in an RV. We’ve even seen some river-route bike tourists carrying folding chairs on top of their gear trailer. So, at least for the few days we spent in Carnac, we were camping properly in Europe. We enjoyed our bright and spacious (though flimsily built) mobile cabin so much that Bill kept extending our stay, one day at a time. It had beds for 4 and a fully equipped kitchen, except for an oven. And the living/dining/kitchen area was delightfully roomy. We enjoyed the chance to have a quiet, shaded place to sit outdoors surrounded by the lovely mature landscape of hedges, lawn and trees. The sounds of birds and crickets replaced the more familiar traffic and construction noises of our usual lodging. There were of course those pesky mosquitoes at night, but we had those in our downtown Paris hotel too. One of the real bonuses for us at the campground was having an outdoor space to reapply the messy and toxic Seam Seal to waterproof our homemade over-mittens. We were pleased to have purchased the glue-like product in Paris but we needed a couple of spare hours to apply it that would be immediately followed by 24 hours of undisturbed drying time, plus good light and ventilation. Good light and good ventilation don’t describe many hotels we’ve stayed in, so the campground was the perfect place for the nasty chore. Drying our mittens and laundry in camp. Our vinyl and plastic campground abode was $37 a night, about half the starting prices of hotel rooms in this resort area. They provided blankets and pillows but no linens, so we used the sleeping bag liners we carry for sheets and an extra shirt for a pillow case. And our viscose camping towels that we now mostly use for towel-drying our hand laundry became our bath towels once again. We had to make a run to the store for detergent, a sponge, and toilet paper but those were small prices to pay for the welcome fresh air and spaciousness we had been missing. And we certainly felt like we were in a different country while in Brittany—just what many tourists long for--France without the French. The people are more approachable and personable and the relationship to their environment is more harmonious, especially in the more southern region. It’s only in Brittany where we had people say that they like the English language and appreciate the efforts of English speakers to speak some French. And it’s the only place in France where someone volunteered their appreciation for the US’s participation in WWII. It was in Brittany that we again started getting daily positive acknowledgment for our journey. There were thumbs-up signs from passing motorists who read our “Madrid to Iceland” sign and light horn toots and waves. We even exchanged a few words with some motorists while we were all stopped at traffic lights. And people on the sidewalks would again sometimes stop to chat when we were parked. It was suddenly like being back in Spain, as all of our interactions with people seemed so normal again. 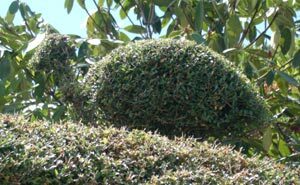 Quail topiary atop a Brittany hedge. Much of rural France cultivates what looks like a managed disintegration of their homesteads. In contrast, rural Brittany is more northern European in its look with a bias towards neatly trimmed hedges, freshly painted homes or shutters, and everything in its place. The Brittany towns and villages don’t have the paved over look of much of France where stone pavers and asphalt are everywhere you look. Often in Breton communities there are canals, creeks, or fountains that bring the liveliness of water into the urban area in addition to the visual relief of trees, lawns, and flowers. It gives Brittany a fresh and vital look compared to the more worn and dried-out feel of much of France. Compared to the rest of France, in Brittany we saw more public spaces to linger in and a more open and welcoming attitude. In much of France the window shutters are tightly closed during the day, to the point that many villages look like ghost towns when we roll through them. In Brittany, usually the shutters are left open, as is often a garage door. It looks more like a person could step out at any moment rather than looking abandoned or shielded. And the less-often covered windows and greater inclusion of nature in the towns of Brittany exude an aliveness and welcoming tone that is quite a contrast to the more closed-off and “go away” message many French towns communicate. One lunch stop aptly symbolized our Brittany experiences. As usual, we were looking for a quiet, scenic and somewhat comfortable place for our daily picnic. Often in France, we search out the village church as one likely place with some public space. The typical church is stone surrounded by stone pavers and if we are lucky, there will be a bench. In Brittany the churches often have a bit of lawn and one afternoon we happened across a 15th century stone church surrounded by a lush green lawn, rimmed by blooming flowers in boxes along the surrounding low wall and a single picnic table under a big shade tree. Unlike most, the door to the church was open and a bit of history in 4 languages was on a plaque outside. We felt utterly welcomed and invited to linger whereas in most such places in France that we stop for lunch we feel like we are barely tolerated and should move along quickly. Like the Basque of Spain, the Bretons of Brittany have a hefty dose of ethnic pride. In both regions their own flag is prominently and frequently displayed. And there is a heavy usage of their distinctive language on road signage in both the Basque and Breton areas, but in Brittany it doesn’t trigger the isolationist feeling we experienced in Spain. In Brittany no one is obliterating the French words on the bilingual signs and we aren’t missing out on things because of the monolingual signage as we did in Basque Country. In Brittany, they assert their heritage as a source of pride but don’t seem to use it as a weapon. Both the Bretons and the Basque are ethnically and culturally distinct from the larger country of which they are a part and both have a long history of struggle to be a separate political entity. But the Bretons last used their violent separatist tactics in the 1970’s and seem to have contented themselves with putting their energy into revitalizing their culture within the French society. Lock and grounded boats at low tide. The tremendous variation in the water level between high and low tides in Brittany—as much as 45’—resulted in some startling images. I couldn’t believe all the large sail and motor boats that we would see balanced on their keels or tipped sideways onto their hulls in waterless harbors at low tide. They looked like someone had just pulled the plug and drained a bathtub full of toy boats. A few even had a pair of spider-like legs planted on the silty harbor floor to keep them upright when the water receded. And each of these harbors always had a stack of colorful, toy-like plastic rowboats that the owners paddled out to their anchored boats when the harbor refilled. Some harbors also had locks like those used in canals to keep one part of the harbor filled during the low tides. And when the tide goes out around the Brittany coast line, it really goes out. In some areas it looked like close to a mile of beach would be exposed. 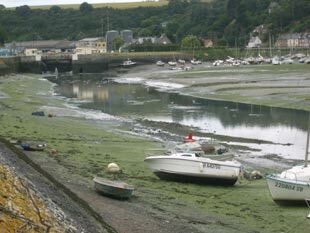 The stench at low tide from all the exposed sea life at some of the harbors and beaches was overwhelming, sometimes almost gagging us like going past a noxious chemical plant. And along with smelling bad, it often wasn't a joy to look at either. It appeared that crews operating heavy machinery would groom the beaches at a few of the popular recreational areas to make them attractive and usable during low tides. As we sat perched on a knoll overlooking a beach and rocky prominences for lunch one day, Bill pointed out that the waves were only going one way. Normally, the wave action gives the appearance of the water rolling onto a beach and the rolling back out again like clockwork. During this transition to low tide, the leading edge of a wave rolled up the beach and then the water disappeared. Apparently something about the water table or porosity of the beach resulted in the thin layer of water in the leading 1-2’ of the diminished wave to be completely absorbed. We watched as over and over again as the leading edge of the most-inland wave only completed half of the usual journey inland and back out to sea. Unfortunately in Brittany (and much of France) coastal views, like where we watched the 'one-way-waves,' were hard to come by. Most of the coastal area roads don't follow the coastline, but are well inland. Usually a sea view required a special detour on a dead-end road, which made biking in this area much less interesting than if the roads followed the coastal contours. And though the roads were inland, we were surprised at the elevation gain we accumulated some days going up and down the numerous little hills, some with some unapologetic 10-15% grades. We have crossed the route of the upcoming Tour de France several times this spring and I am amazed at how exciting I find it. Our years of watching a half hour summary of the event on TV at home each night of the 3 week race and catching 4 different events in France in 2001 were enough to let my mind fill-in the picture of those powerful, sweaty guys flying by on the roads currently before me. Some of our daily village and rural scenes look exactly like what we've seen before on TV. It’s exciting enough just to be where they will be in the weeks ahead—I don’t really long to be here in the middle of the chaos. The Tour de France is kind of a joke to watch in person. You dedicate the day to getting to some point on their route and then wait for hours after the road has been closed to traffic. The lead cars finally come, creating some pageantry and welcome entertainment. But if you are watching for Lance, you’ll only see him for seconds as these guys are so incredibly fast. You've spent the day waiting and the majority of the peloton (the main pack of riders) passes by in minutes and then its over for your day of viewing of the event. We discovered in 2001 that you really get more out of it by watching it on TV than being there—though being there once was worth doing. I was pleased when I realized that for the first time in 4 years, we’ll be in an English speaking country (England) for about a third of the event and we’ll actually be able to understand the TV coverage. But the joke is that lodging in England is so expensive that we’ll likely end up in rooms without TV. But at least if we can steal a few minutes of viewing time on TV's in electronics stores as we have done in the past, we’ll understand the coverage. We’ll be in Iceland for the remaining weeks of the tour and again because of the cost, will likely be in rooms without TV’s. And its hard to imagine that cycling is a sport they devote a lot of TV time to that far north. Our next stop in our squiggly, northwards route through France will be Normandy and we'll be there just after the 60th anniversary of the WWII invasion. Our original plans would have had us there during the celebration, which we decided to avoid. Accommodations would be harder to come by and George Bush’s presence would make it downright dangerous. So, a part of me is sorry to miss the extra events that would be available, but our need for ease and safety definitely have won out. But the bonus for being here at this time is that both the BBC and CNN are doing commemorative TV specials building up to the event, giving us spoon-fed introduction to the area's history. We are in the last days of our 17 night trip to Iceland and may be back in London before we find a place to send this update your way. Our next update will be out soon, which will explain more about how we got to Iceland.